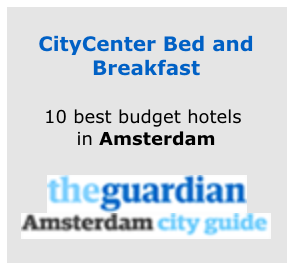 Amsterdam Bed and Breakfast CityCenter is just a few minutes walk from Central Station and Dam Square. My B&B is a quiet oasis, right in the historical centre of Amsterdam. We offer cozy and comfortable rooms, plus a personal touch you won’t find at regular hotels. I hope to welcome you soon. Sint Jacobsstraat and the house are very quiet. The Amsterdam b&b CityCenter is in a 19th century original monumental downtown house. So, if you want to relax after a full day or a long night, this is the place to be. When you wake up, you can expect a creamy and delicious breakfast served in the room. With free internet WiFi and all tourist information available in the Amsterdam b&b, you have all the ingredients to discover the best that Amsterdam has to offer. From its first days in the 11th century, Amsterdam has been a free and slightly rebellious city. Here you'll find yourself in the very heart of it. You have all the tourist attractions, museums and nightlife at hand. 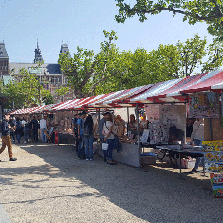 Whether it's the Dam square, Beurs van Berlage , the famous Jordaan area, Anne Frank's house, the flower market or the gay Warmoesstraat, it is all not more than a few minutes walking. Feel free to ask me for any advice. I speak English, Italian, German and Dutch. As you are in the Venice of the north, a canal tour is one of the best ways to discover the unique feeling of this city. With central station just around the corner, you can go everywhere you like. Bed and breakfast Amsterdam CityCenter offers also bike, city tour, countryside tour, museum reservation service. 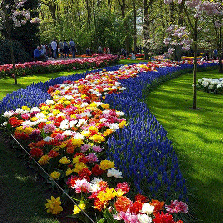 The Keukenhof, alias the garden of Europe, is the largest flower park of the world and is going open again from 21-03-2019 to 19-05-2019. More than 7 million flowers in bloom. If you are visiting Amsterdam, you cannot miss it. An explosion of colors and perfumes.